On Jeju Island (Jeju-do, 제주도), where my parents are from, fresh abalone (jeonbok, 전복) are abundant. 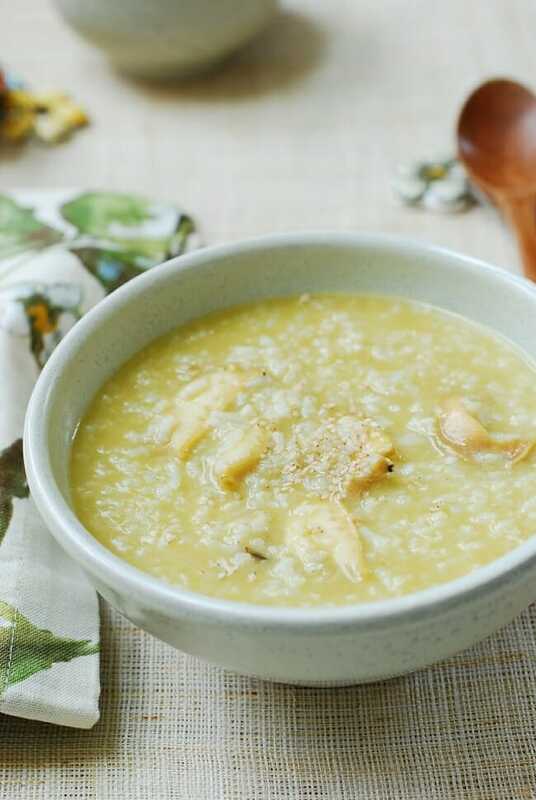 Porridge made with abalone (jeonbokjuk, 전복죽) is one of the most iconic dishes of the island. 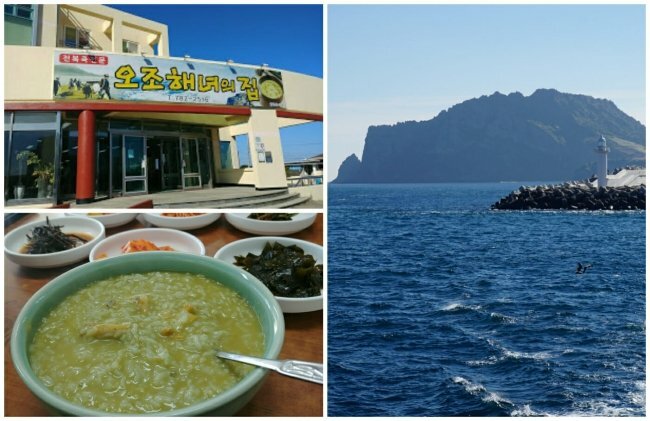 When we visited last fall, my cousin, who’s a Jeju native and always happy to show us around, took us to a place famous for its abalone porridge. It was deliciously briny, with a distinct greenish hue and chunky abalone pieces. 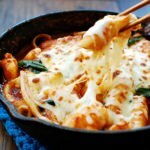 As my parents would say, that’s how jeonbokjuk should be! 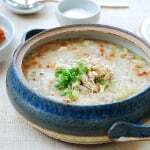 So, here’s abalone porridge recipe Jeju-style! Abalone are highly prized shellfish. 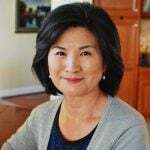 For centuries, female divers in Jeju-do collected abalone and other seafood for a living by diving deep into the ocean floor for several hours a day. They are known as haenyeo (해녀) in Korea, meaning sea women. The number of haenyeo has sharply declined in modern days as other job options have become more available. As such, today’s high demand for abalone in Korea is being mostly met by farmed abalone. Finding abalones fresh from the ocean is almost impossible where I live. Some Korean markets carry fresh abalone in their fish tanks, but they tend to be small and quite expensive. So, I normally buy frozen abalone in shells, which are usually from Chile. If you’re in Korea or any other part of the world where fresh abalones are more plentiful and affordable, needless to say, use the fresh ones. 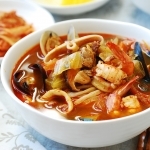 The Jeju-style jeonbokjuk is made simply with rice and abalone. It captures all the flavor the abalone have to give by also using the internal organs (viscera), hence the greenish hue. The dark green sac of guts may not look all that appetizing, but it really enriches the porridge. 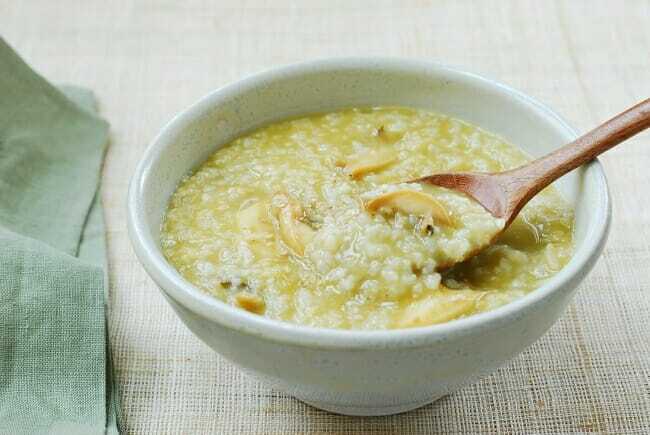 The color of the porridge depends on the number and the size of the abalone used. 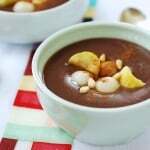 If you don’t care for the guts in your porridge, you can leave them out. 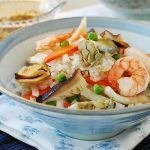 You can also add chopped vegetables if you’d like. Easy to digest and nourishing, this porridge is especially comforting when one feels under the weather. Also, check out my chicken or pumpkin porridge. 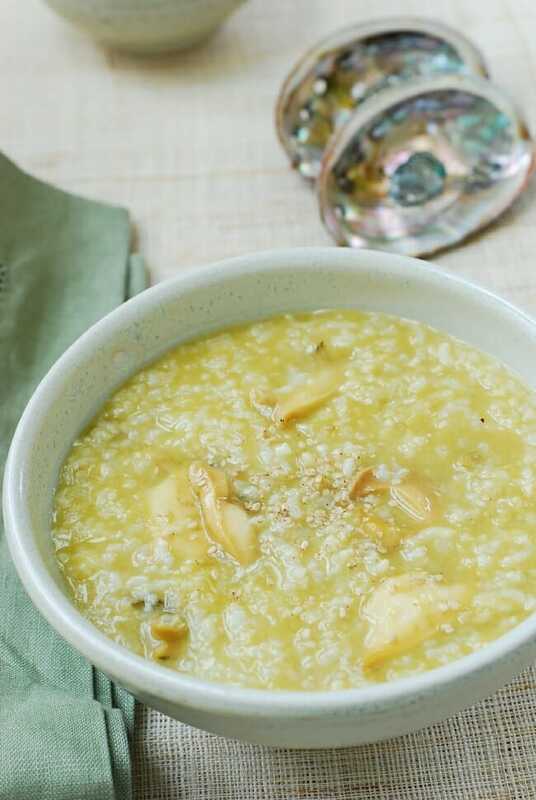 Rich, creamy Korean porridge made with abalone! 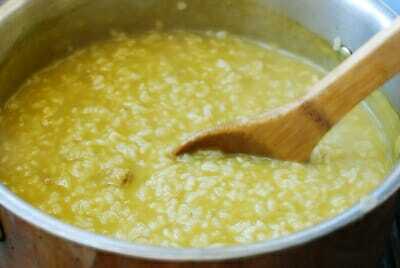 Soak the rice for about an hour and drain. Scrub off the dark edges of the abalone with a kitchen brush or toothbrush. 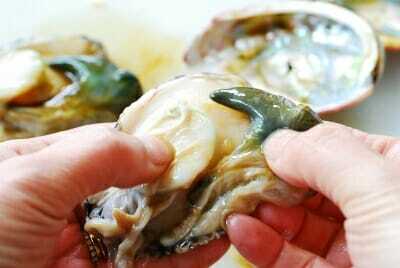 Remove the abalone from the shell by working a spoon or small spatula around the muscle attached to the shell. Carefully cut off the viscera (guts) with a knife, or pull it off by hand. Cut off the tough pointed end. Slice the abalone meat into the desired thickness. Chop up the guts into small pieces, and scrape it off with a knife in to a small bowl. 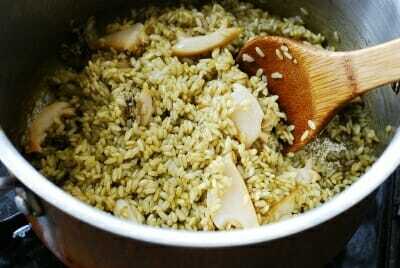 Add the rice and the guts to a medium size pot. Mix them well, breaking up any lumps of guts. Add the sesame oil and stir until the rice starts to turn translucent over medium heat, about 5 minutes. Throw in the abalone pieces and stir for a couple more minutes. Add 6 cups of water and bring it to a boil over medium high heat. Reduce the heat to medium, and continue to boil, stirring occasionally (more frequently as the stock is reduced so the rice doesn’t stick to the bottom of the pot), for about 25 minutes. 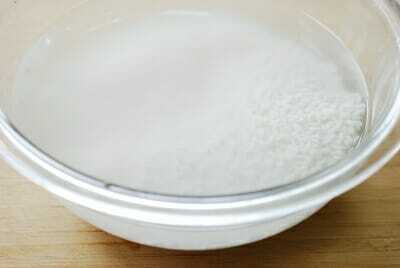 At this point you can adjust the consistency of the porridge to your taste by adding more water, up to 1 cup. 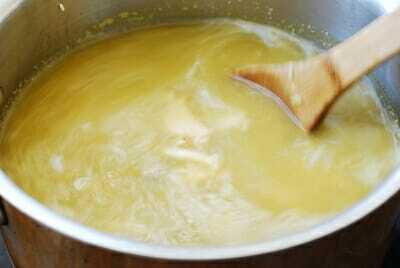 If adding more water, cook for a few more minutes, stirring well. Further reduce the heat to medium low heat as necessary. 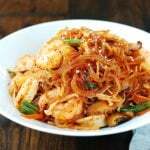 Add salt or soup soy sauce to taste right before serving. 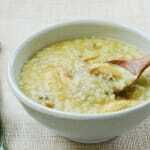 The seasoned porridge can become watery over time, so the porridge should be seasoned right before serving. Which rice do you use in US? Is it the short grain one? Would if you can share brand name too. Yes short grain. I usually look for the one on sale, not a particular brand. All major brands are fine. *would love it if you can share…..
how do you ensure that the abalone don’t harden when you are processing it? Most of the time when I process it, it turns out hard which i think the abalone stiffen when it knows i am hurting it.